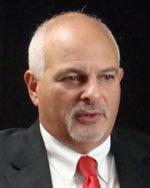 Scott Wasser, V.P. & executive editor, Portland Press Herald, says the major change in his newsroom in recent years is its commitment to reporting the news 24 hours a day. He wants his reporting staff to post every story, online, as soon as it is written. “We don’t wait,” he says. Scott Wasser, V.P. & executive editor, Portland Press Herald, says his newspaper has posted video screens in the newsroom that follow the traffic on the newspaper’s website: www.MaineToday.com, and its main competitors. The goal is for the Herald’s reporting staff to see what stories are drawing readership and what are not.